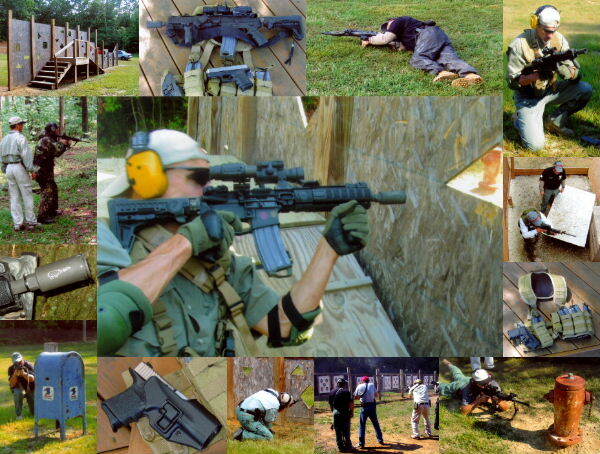 TDI's Tac Rifle students are a cross-section of civilians, law enforcement, and military. So there I was: Monday morning, September 22, the Autumnal Equinox - when the sun lines up directly over the equator and summer officially ends. I was driving home through the Ohio Valley, replaying in my mind how I’d spent the last two days training in TDI’s advanced carbine course, Tactical Rifle II (TR-II). The area where TDI is located is about as rural as southern Ohio gets. I passed farms with aging barns and fence-lined fields, many littered with huge donut-shaped rolls of hay. Some had to be seven feet tall. Amish buggies made their way along the roads cutting through the rolling hills. Deer would appear now and then in the clearings between the timber where the power lines run. You could smell fall coming in the cool morning air. Once the fog burned off, the sky got clear and bright. It was another sunny, cloudless day - warm but no humidity. It was the same perfect weather we’d enjoyed for training over the last weekend of summer. To avoid redundancy, this review describes the features of TDI’s advanced TR-II course and how (or where) it differs from the level-one course. Once you’re registered for the advanced course, TDI will send you a list of the mandatory and recommended items to bring, which, if you’ve done this kind of training before, you should already know. For TR-II, TDI recommends 1000-rounds of .223/5.56mm ammo. I shot just over 1200-rds of PMC .223 (55gn FMJ). Some students got by with less, say, 800 to 900-rds. If I can, I prefer to shoot drills more than once in order to hone my skills. Repetition, under supervision, allows you to get a specific technique down and improves weapon manipulation and coordination. Plus, there’s no downside to bringing extra ammo, because what doesn’t get shot up in this evolution can be used for the next. A Lewis Machine & Tool MRP w/ 10.5" barrel. The KX3 is called the "Flaming Pig" for a reason. Shooting PMC 55gn ball ammo produced impressive fireballs in low-light drills. The good news is that the device reduces noise and deflects concussive blast downrange. My SBR ran without any problems and shot great. I didn’t bother to clean it during the course, but did keep it well lubed. 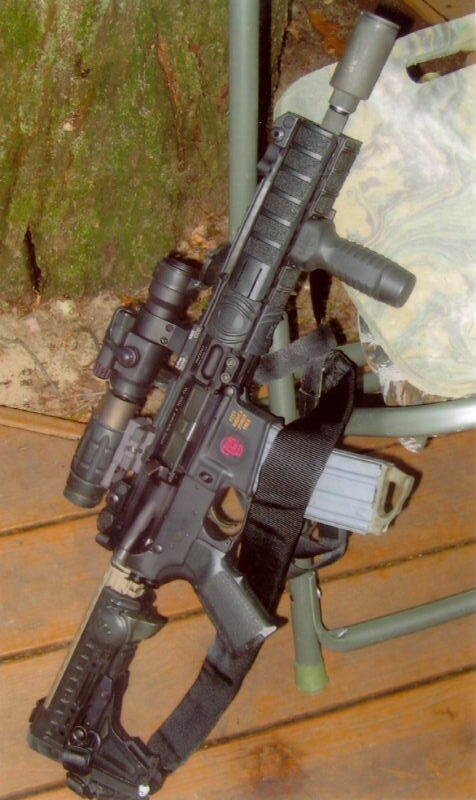 For optics, I used Aimpoint’s ML2 Red Dot in a LaRue M2 Mount, behind which is the 3x Magnifier in a Samson Quick-Flip. As long as I did my part, the gun’s 10.5” tube held good groups and stayed competitive with the 16” carbines out to 300 yards. Student from Chicago drove 8-hours for the TR-II class. 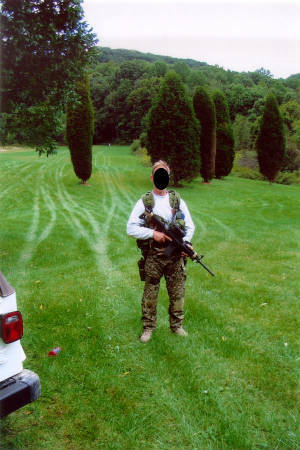 His AK has a red-dot optic mounted on the upper hand-guard. Less "high-speed" than others maybe, but it's the singer that matters, not the song. He shot well and scored effective hits during the Move & Shoot drills. 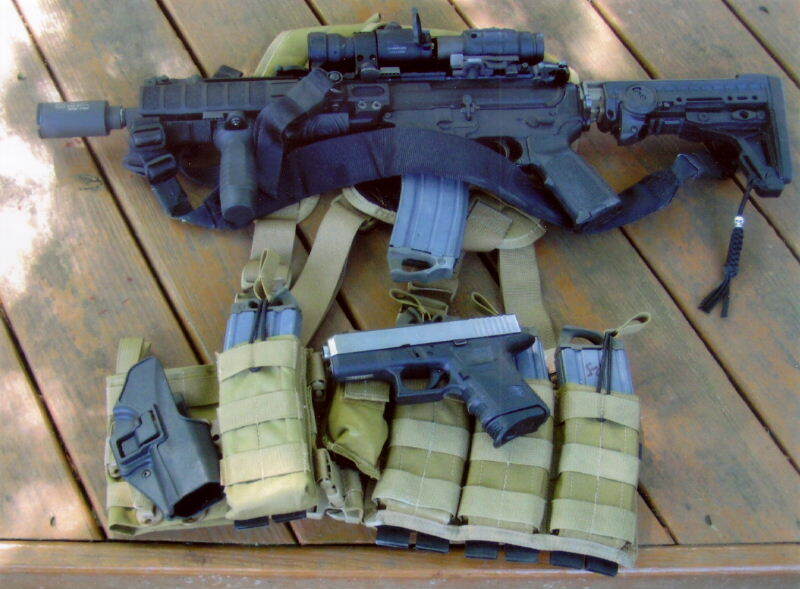 My magazines were a mixture of 20-rd Colt’s, 30-rd LaBelle’s, and MagPul 30-rd PMags. All worked fine. 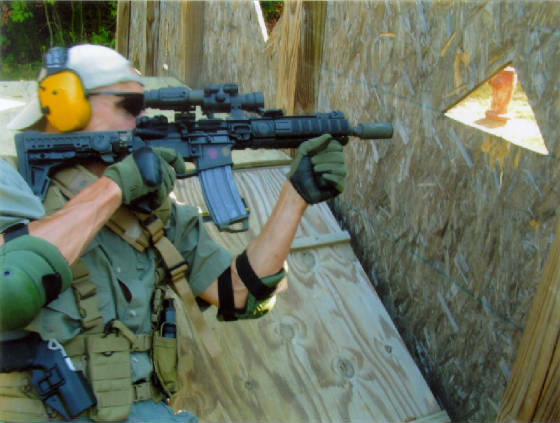 For slings, I alternated between a 2-point VTAC padded sling from LaRue Tactical and a Troy single-point sling. Frankly, I found the Troy easier to manipulate when shifting into weak-side (support-side) shooting positions, whether in the field or in one of the Live Fire Houses. 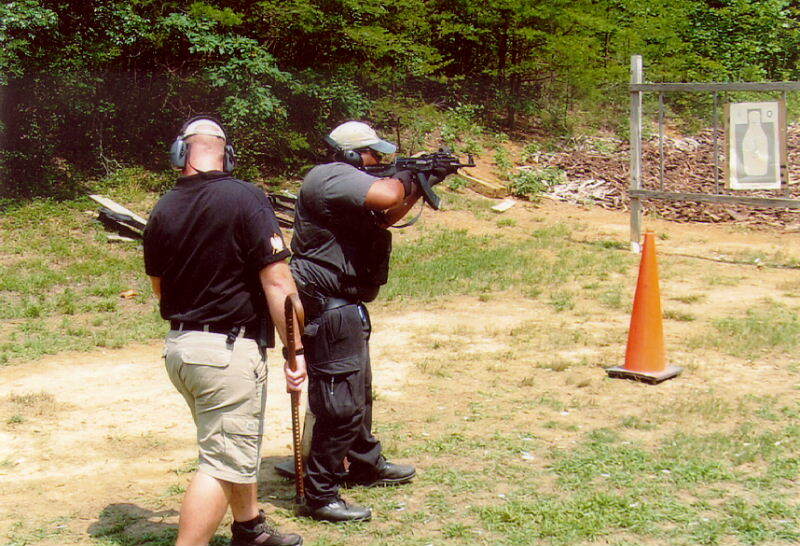 Most students in class used standard 16" carbines. One used an AK-47, and another brought an AK as his second rifle. One student ran a suppressed 14” SBR. 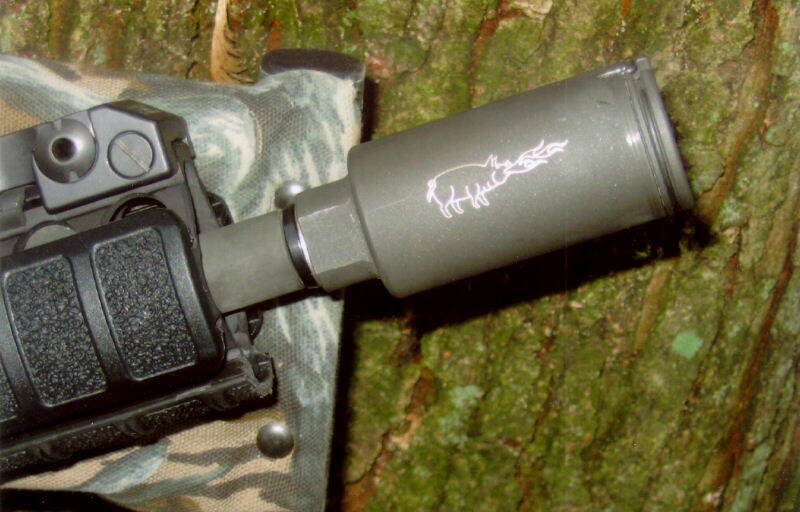 Only two students experienced problems with their ARs, and one was traced to a bad mag. He promptly discarded it and his weapon ran fine afterward. The other rifle continually malfunctioned, with bolt-over-round jams and numerous failures to extract. An instructor replaced the extractor, but intermittent hiccups continued. The final diagnosis, as far as I know, was not determined. 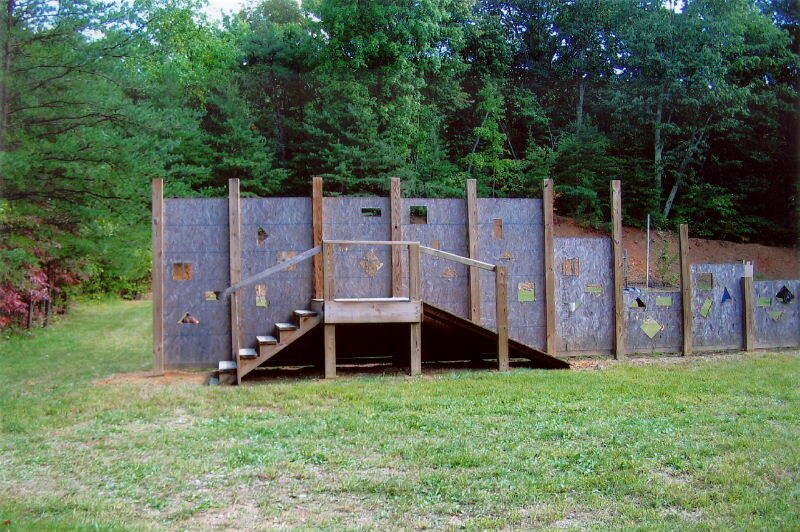 Two students shot the course entirely with iron sights. Everyone else ran an optic, even if they did some initial shooting with their irons. 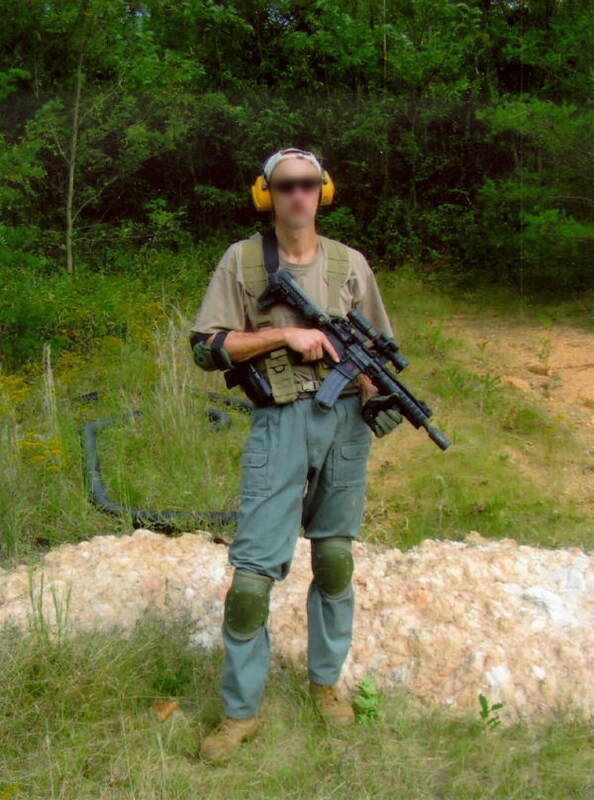 EOTechs and AimPoint red dots were the common optics I observed. One student had Aimpoint’s new and very compact T1 red dot; another used a 1x4 scope of some make. There were no reported problems with the optics. On the evening of the first day, we practiced low-light "Move & Shoot" drills, which included using our weapon-mounted lights as well as manipulating hand-held flashlights. The pictures below, however, show the day-time drills. My MRP 10.5" SBR and G29. 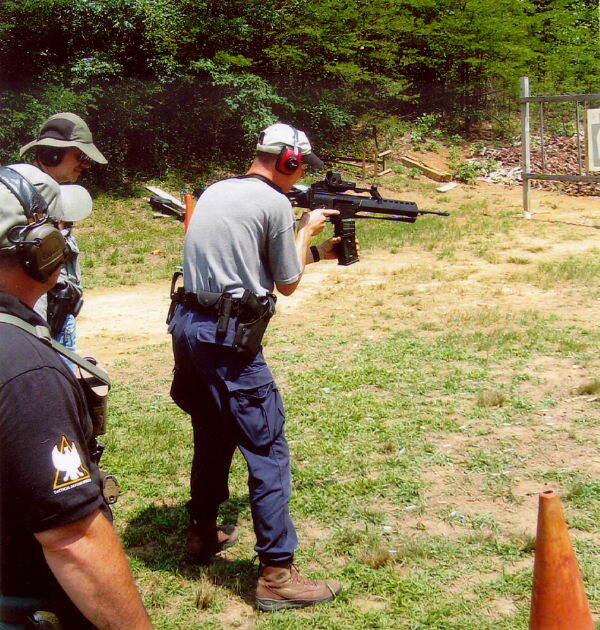 For this training evolution, the micro-barrel carbine was matched with a compact pistol. Both were handy and portable. What's not to like? For this course I simplified my gear with an eye to reducing weight. 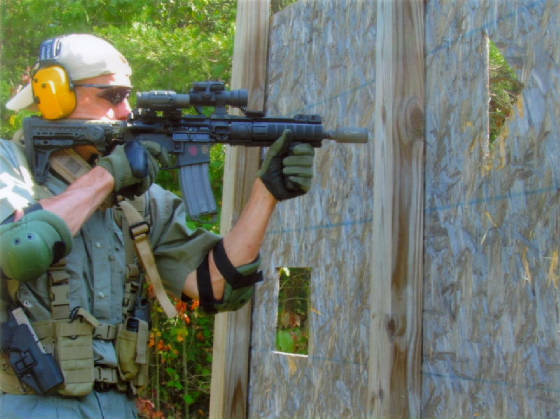 I’ve taken classes where some students show up wearing massive chest rigs that look to be carrying 18 magazines. They’re heavy and hot and typically get discarded before the end of the first day. In fact, over time, my thinking on gear and gadgetry has pretty much settled on the frugality principle of using for training just what I’d use for the real deal and not much more. In other words, use in class what you’d use for the task or mission, and avoid stuff you don’t need, or can’t or won’t use. This requires that you think through EVERY piece of gear or gadget you have - preferably, before you get it. As with any learning curve, however, realize that sometimes there’s no avoiding the trap of buying an item that doesn’t work out as expected (or as advertised in one of the gun rags, where you saw it on some super-cool, HSLD operator). But don’t beat yourself up about it either - just learn from the experience. For what it’s worth, I’ve met students in various carbine classes who’ve described undergoing several “gear evolutions” before finding a specific set-up that works for them. 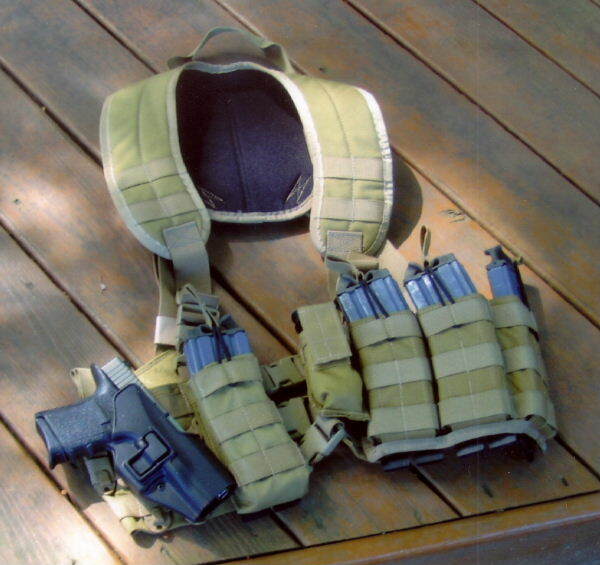 Tactical Tailor 2-piece MAV with X-harness and 5.56 mag pouches. 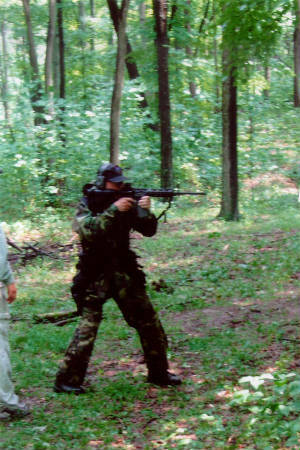 My personal gear was a MOLLE-compatible, two-piece MAV unit by Tactical Tailor using the X-harness. Three 5.56mm magazines road in a 3-pouch panel on my left side, with a single 5.56 pouch on my right. 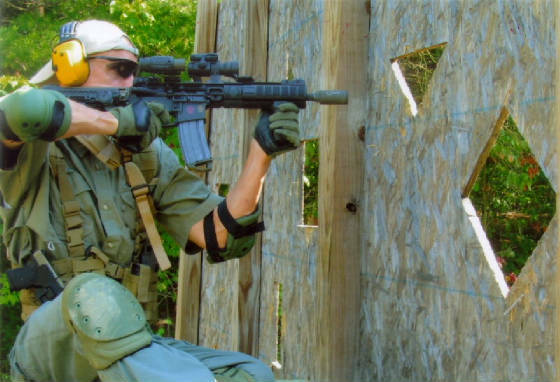 On the MAV, behind my left hip, was a dump pouch that could easily hold another couple of mags. With this set-up, and counting the mag in the rifle, I could step on line for a drill with at least 5 loaded mags ready to go - with the option of a couple more or less, depending on the drill. 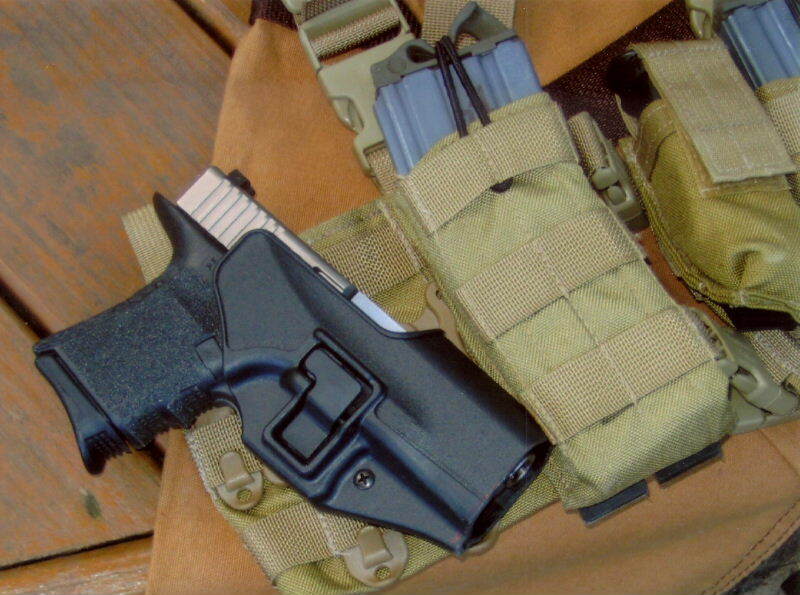 For the TR-II course, I brought my Glock 29, carried in a modified Blackhawk SERPA holster on the MAV. On the right side of the MAV, a modified BlackHawk SERPA holster held my 10mm Glock 29. This was loaded (10+1) with Double Tap’s 180 FMJ training load. A small pouch on the front of the MAV held a spare 10-rd mag. In fact, the G29 proved to be a handy companion for the 10-K: a compact sidearm teamed with a short-barreled carbine. 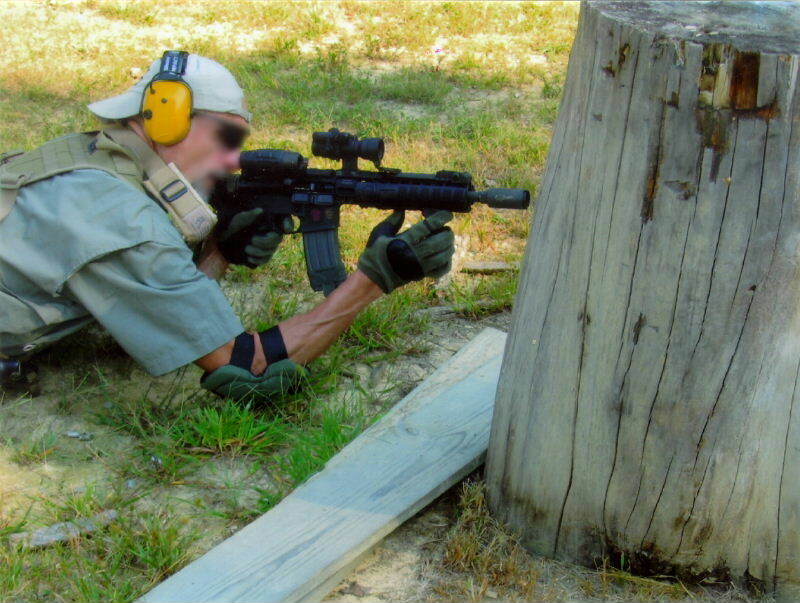 One training component of TR-II involves learning some of the more unusual or contorted shooting positions beyond the standard ones taught in the basic class. The tactical conditions prompting their use are also addressed. Under these circumstances their utility becomes obvious, such as the one sometimes called “urban prone” or “North Hollywood prone.” They keep you alive while enabling you to return fire. In these positions, my Hatch elbow and kneepads proved comfortable and flexible. While some drills and scenarios are similar to those in the basic class, those in TR-II generally include more complex or expanded features and thus more difficulty. Others were unique to this course. In TR-II the Jungle Trail scenario is expanded to include a precision component, but to heighten stress the time frame is shorter. 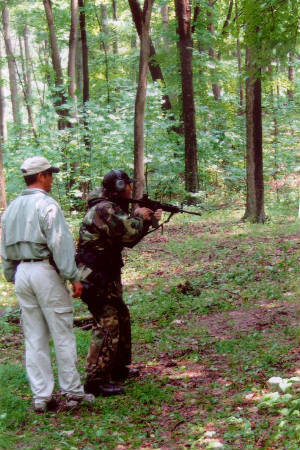 In the basic course, you started at the trail’s edge and had 20-minutes or so to find and engage all the well-camouflaged “bad guys” (targets) hidden in the brush, behind fallen trees and down in gullies. In TR-II, however, you get only 12-minutes and your run begins on a hillside 225 yards away. There are two “sentries” (steel silhouette poppers) guarding the trail’s entrance that have to be taken out first. The clock starts running on your first trigger pull. If your first two shots knock down both sentries, good for you, you’re ahead on time. Then you start down the hill to the trail and begin working it. Jogging over there is designed to get your cardio up, whereas walking eats into your time. Some students expended over a dozen rounds, and precious minutes, just trying to down those sentries. 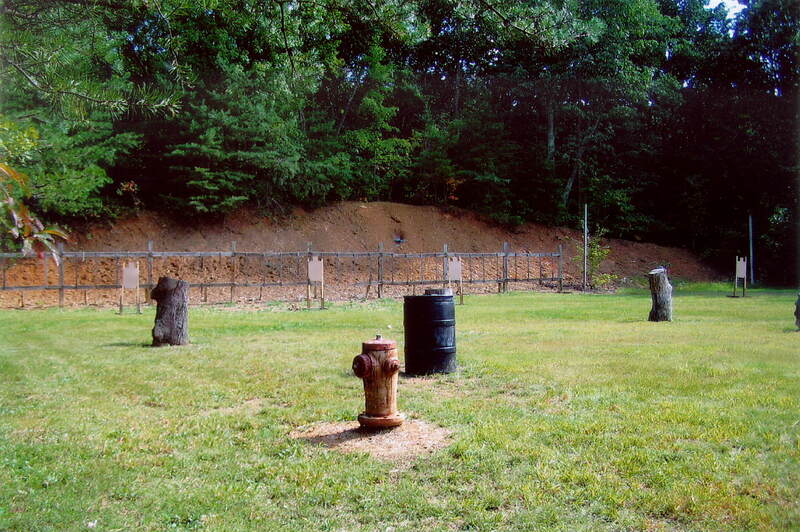 Once on the trail, there are 2 or 3 more hidden targets than in the basic course. Also, if you come within 15 yards of a target without having detected it, you are deemed “hit,” a casualty of hostile fire. The key to the Jungle Trail is to develop visual acuity by adopting a search pattern that gets your vision moving high-low, left-right, and near-far. In other words, a pattern that avoids “seeing” on only one plane. Also, the instructors advise to look for “target indicators.” In the natural world, certain shapes never (or almost never) occur, like 90-degree angles and perfect symmetry. Look for things like square lines, odd-colors and out-of-place patterns or objects. The following pictures illustrate the Jungle Trail scenario in TR-II. Jungle Trail (JT) in TR-II. Slightly left and high over this student's right shoulder, you can see one of two white poppers 225 yards away. That's where the JT starts (the other popper was down). In TR-II, you have 12-minutes to complete the JT. Time begins running on your first shot at these poppers. Once they're down, you jog to the JT and start hunting for targets. Between the patchy lighting, uneven ground, thick brush, and fallen timber, targets can be difficult to spot until you're almost right on them, which is too late. Here, a military student sweeps the nearby area. Veteran TDI Instructor Jay Greaves watches. Student came within 10-yards of a bad guy, concealed by thick brush to his immediate right, before spotting it. Though he swung his rifle and drilled it, the instructor declared him "KIA," with next of kin to be notified. The Wall on TDI's Upper Range. Note the staircase and the "windows" of different shapes and heights. • transitioning smoothly to your sidearm when needed. View here shows targets and objects in the field. Objects are used for cover as you negotiate around the course counterclockwise after fighting down the Wall from left to right. 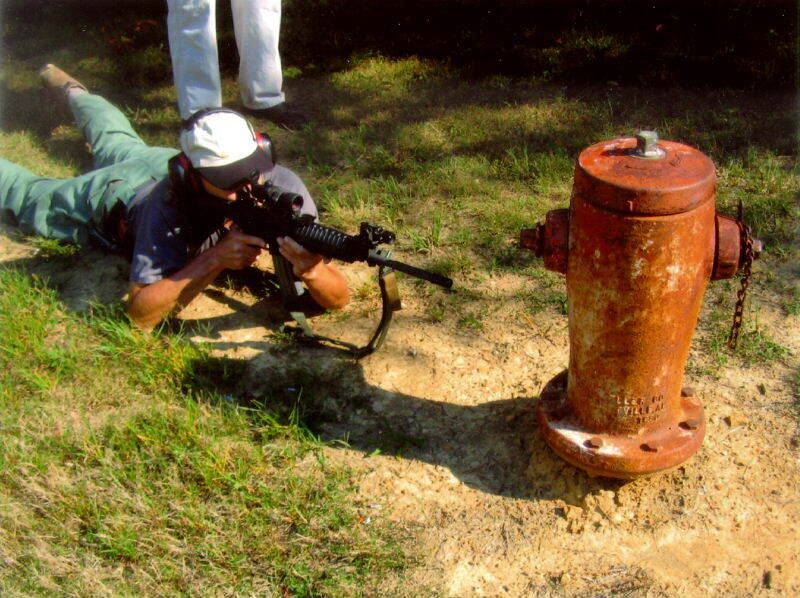 The bad guys you’re engaging in this drill are targets set up 75 yards beyond the Wall, with what amounts to an obstacle course of various objects, like fire hydrants or tree stumps, placed in a field between the Wall and the targets. The drill begins behind the Wall at the far left side. The Wall is pockmarked with “windows” of different shapes and heights. 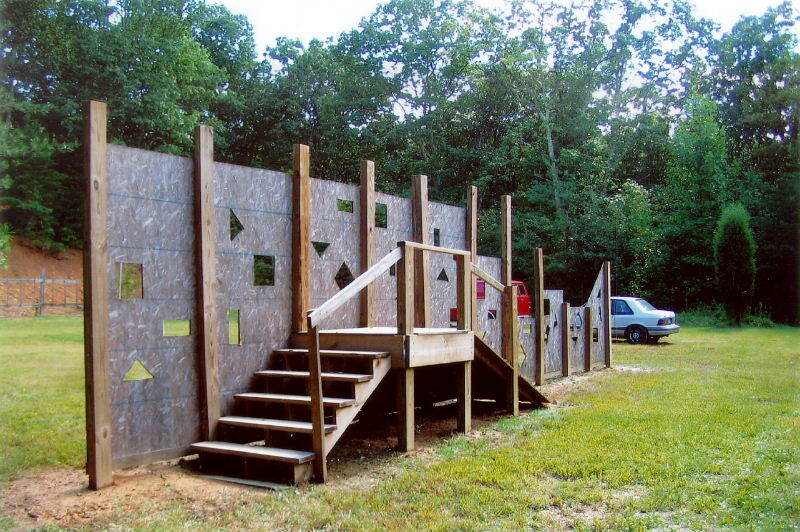 At the start, the instructor calls out a particular shape (e.g., “triangle!” or “square!”), and that’s the window you’ll be shooting through as you fight your way down the Wall. As you go, you’ll assume whatever shooting position is needed to get two shots on each target (that you can see). Although not used during our run, the cars on the far right can add further dimensions to the advanced training. Once you reached the right side of the Wall, reloading as needed, you then make your way into the field, shooting from behind whatever object best serves as cover. 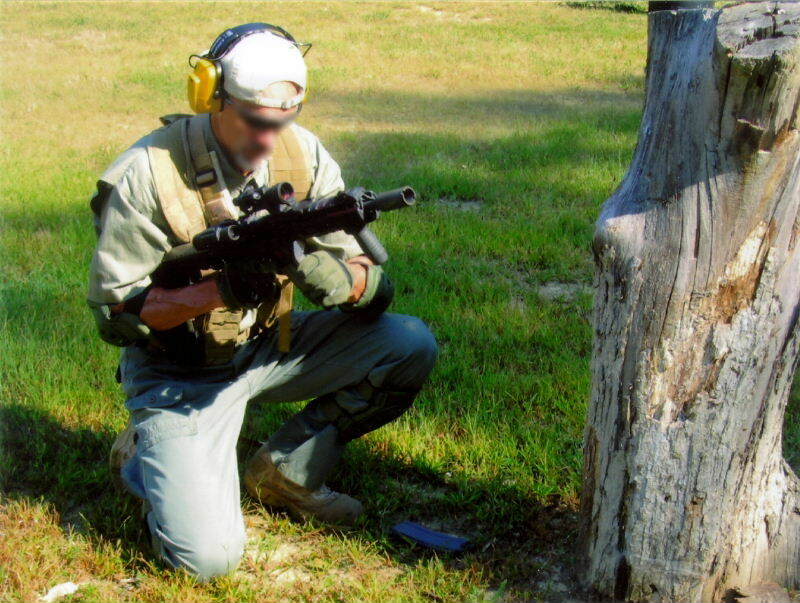 You’ll engage targets from a position dictated by that cover and/or the target’s location relative to yours (e.g., using weak-side prone, strong-side kneeling, etc). As drills go, this is a long one and it takes time to complete. Students might fire through five or six mags. Each student on our team got two runs - the first for familiarization; the second against time. I burned through five magazines on my timed run. Shock and Awe - One Round at a Time. 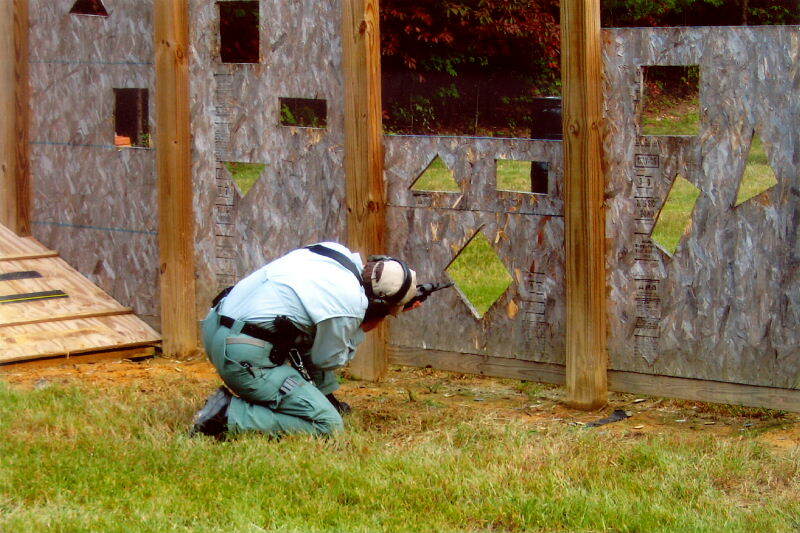 The Wall drill tests how well or how poorly a student has integrated the multiple skills and manipulations required to fight effectively with a tactical rifle. Add time-pressure and increased cardio output, and the result is a great drill. I dropped into a "quasi-reverse" prone, then lifted my torso to shoot through this window. Regardless of your position, remember the off-set height between the sights and the muzzle so your rounds don't spray the Wall. Solving problems beyond the Wall. To minimize exposure, I used the drop-out technique in this position. Staying in the Fight: Third Tactical Reload. I burned through 5 magazines on this run. The key here: do the reload before the mag runs dry and do it safely behind cover. Your tactical toolbox should contain the ability to shoot accurately from the weak-side, as needed, and the manipulative skill to get the weapon switched over there smoothly. In my opinion, the Wall is a great drill. First, as befits a more advanced class, the duration of the drill itself, along with the stress induced by the clock, gets your cardio pumping. People who aren’t in shape are quickly panting and sweating before they’ve finished. Your stamina - or lack of it - will affect your agility in moving, the tendency to fumble while manipulating your weapon or magazines, and the accuracy of your shots. 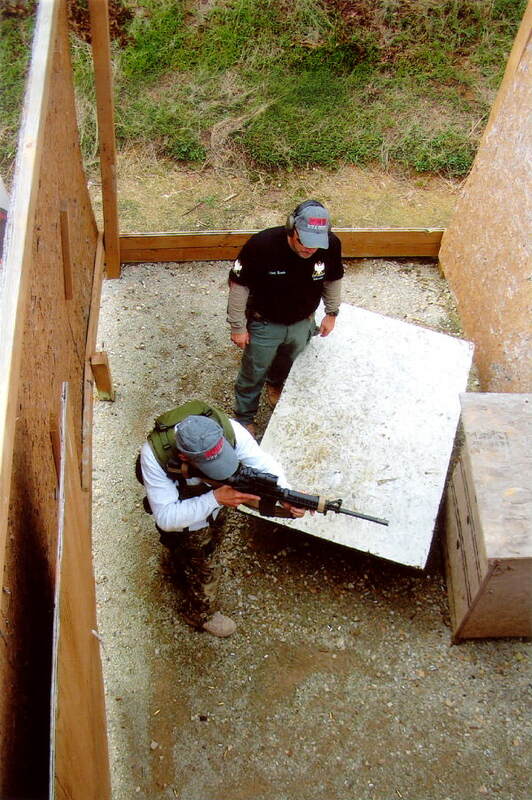 Second, this drill really tests the level to which a student has integrated the multiple skills needed to fight effectively and fluidly with a tactical rifle. It can certainly serve as a “wake-up” alert for areas where more work is needed. This student rolled into a cramped kneel to get shots on target. Well back of the fire hydrant, this proned-out student uses the cover and the shooting angles effectively to score hits. 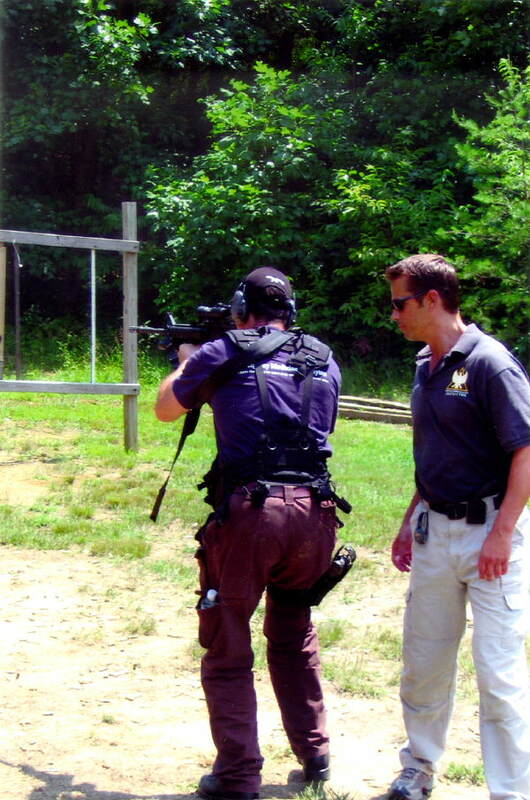 (3) CQB Drills, Position Shooting & Live-Fire Houses. 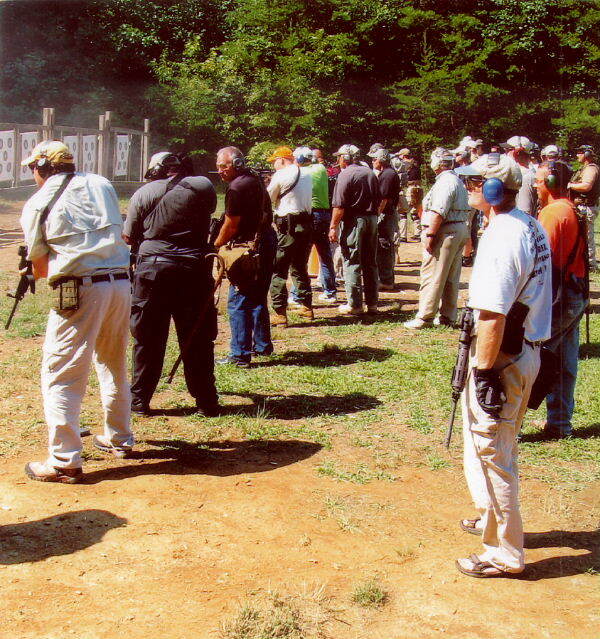 Various CQB drills and new shooting positions were part of this course. Aside from practicing standard positions like prone, kneeling, squatting and standing, we also learned and practiced several variations of roll-over prone. “Move & Shoot” (M&S) exercises included shooting from “called” positions. Students began walking toward their targets from the 100-yard line. 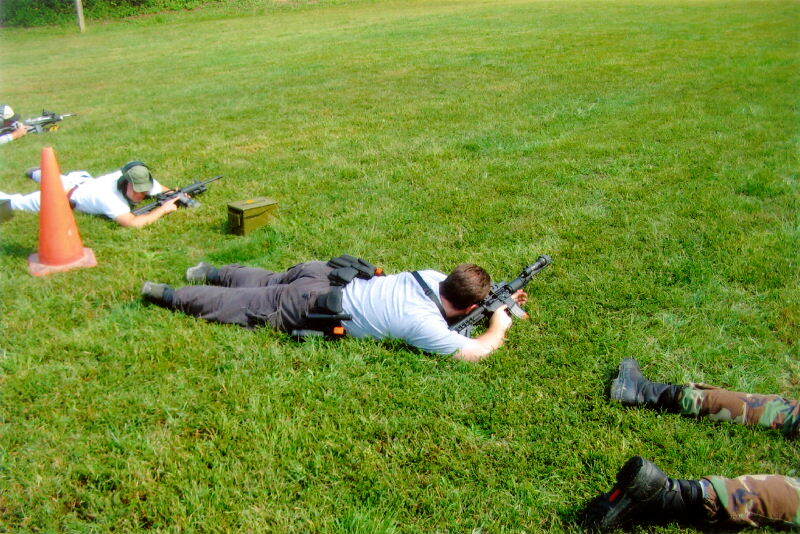 As positions were called out (e.g., “weak-side kneeling,” “roll-over prone”), students dropped into that position and fired a string of 5-rds. This continued until about the 10-yard line when other drills commenced from that distance. Another was a reloading drill using five or six magazines. Students loaded one mag and fired two shots into their target’s upper thoracic area, then dumped that mag and loaded the next one. Another two shots, that mag got dumped and the next one was drawn and loaded. This continued through the remaining mags. The line is hot during reloading drills. Gear used can vary widely. The idea here was to develop a smooth, fumble-free technique of drawing a fresh mag from your carrier or chest rig and firmly inserting it into the mag well. Just how smoothly a student accomplished this was a matter of coordination, prior practice, and how well or poorly his carrier or rig was set-up. As well, students were repeatedly instructed to tug down on the mag after insertion to ensure that it had seated and locked-in. Some students saw their mags promptly eject on the next shot because they failed to check seating after insertion. Sidearms were about evenly split between 1911s and Glocks. 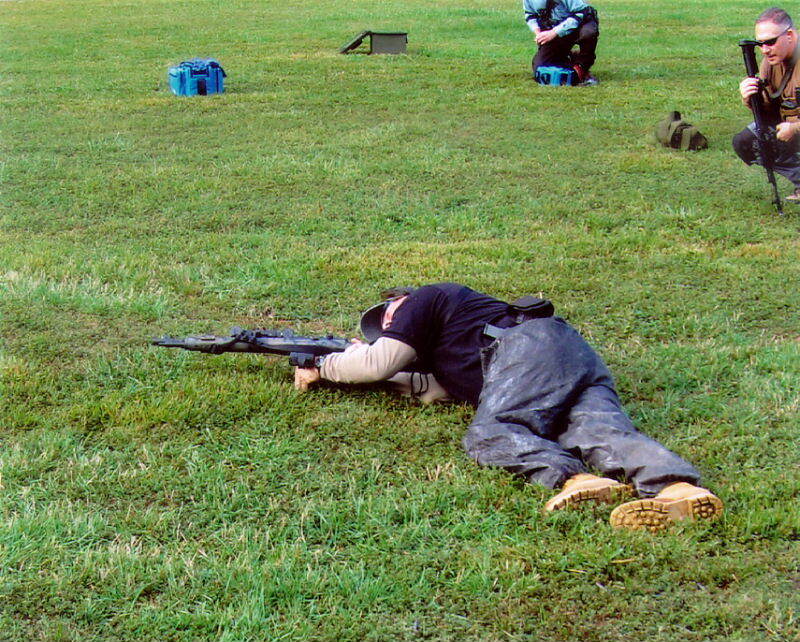 Time was briefly spent on rifle-to-pistol transitions, but not as much as with other drills since transitions are covered quite well in the basic course. M&S drills also included the “X”, “Box,” and “Weave” drills, all described more fully in the TR-I review (see link above). 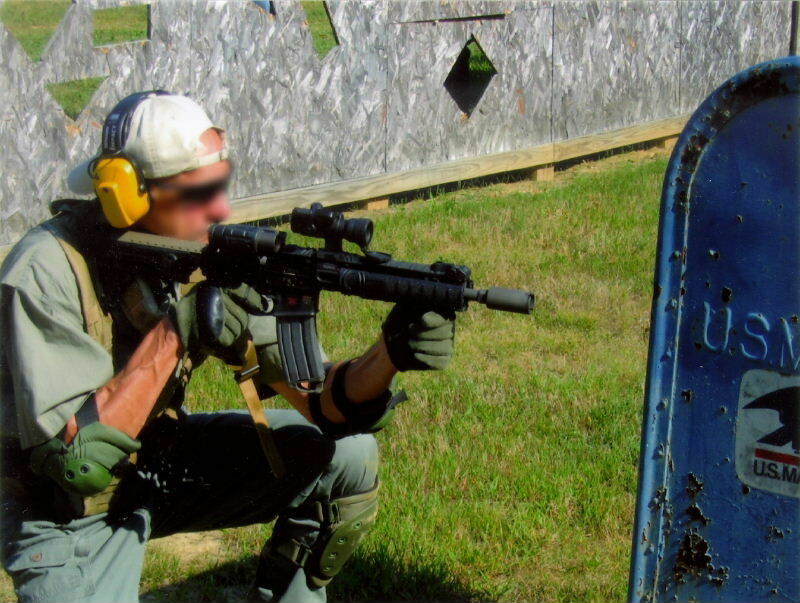 Other close-in drills involved CQB snap-shooting on small black bulls eyes. 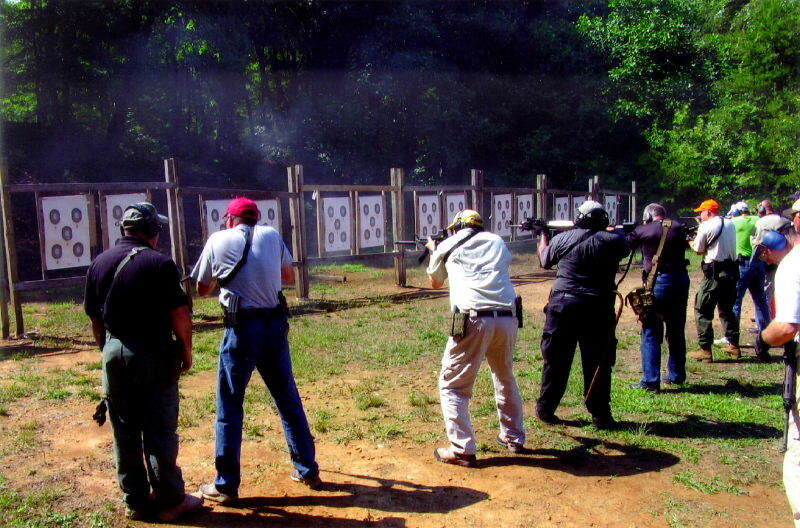 This was done from standing with “called firing.” Students squared up facing their targets and, while maintaining good form, delivered a string of shots as called by the instructor, such as “hammers,” double-taps,” etc. Most students showed good fire discipline and scored accurate hits, as opposed to spray & pray. TDI’s two Live-Fire Houses (LFH) play an important role in the school’s pistol and rifle training, and we spent time working through them. Because this training, and the tactics involved in negotiating these structures, was covered in detail in the TR-I review, I’ll avoid repeating it here. (Again, see the link above). The LFH pictures below illustrate this experience just as well anyway. Student here is engaging targets on the "Box" Drill. Instructor Greaves observes. 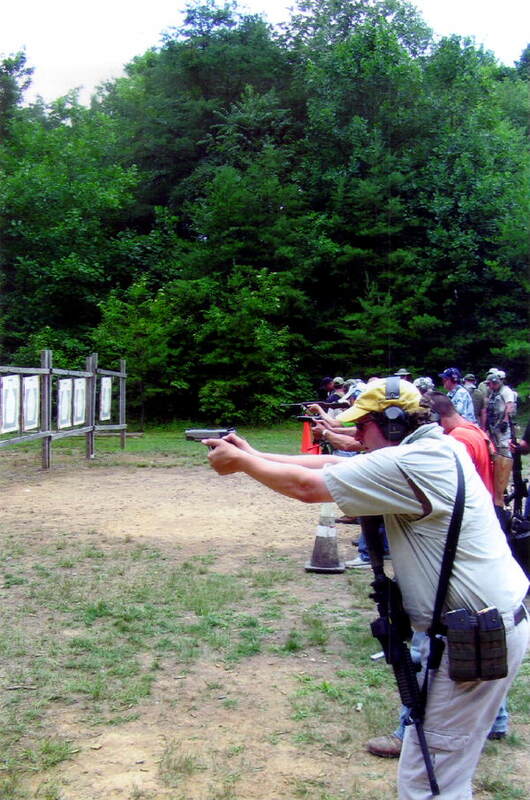 Here, students practice snap-shooting, trying to keep double-tapped rounds inside those small bullseyes. A student finishes his run on the "Weave" Drill. 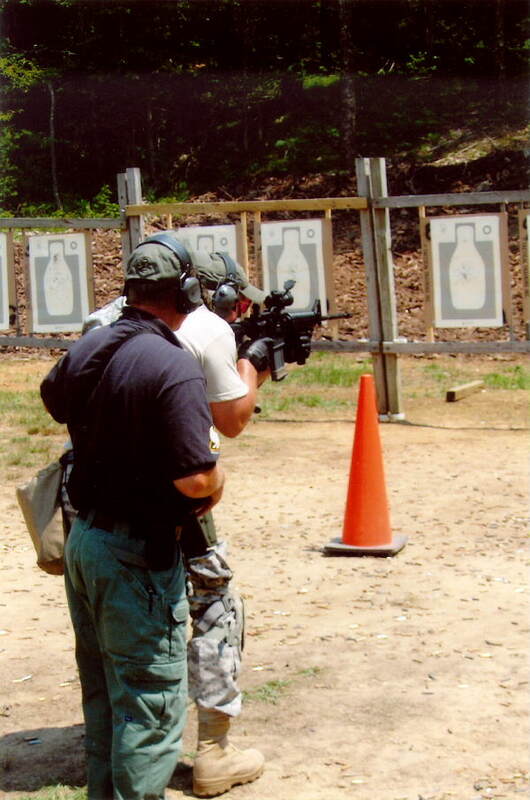 Instructors continually monitored good shooting form and weapon manipulation. Working the angles inside Live-Fire House #2. This student moves carefully to "pie" into the next room. Senior TDI instructor David Bowie observes. Same student correctly executes TDI's Drop-Out technique. Having pied and cleared the room to the edge of door, and keeping his right foot 5-7 inches back from an imaginary line at the edge, he maneuvers his rifle around the wall by J-hooking it and muzzling-up on target. All without overexposing himself during the movement. The key to the technique is foot-work, body control and LOTS of practice. Bad Girl waits for you with her .357 Snubby. 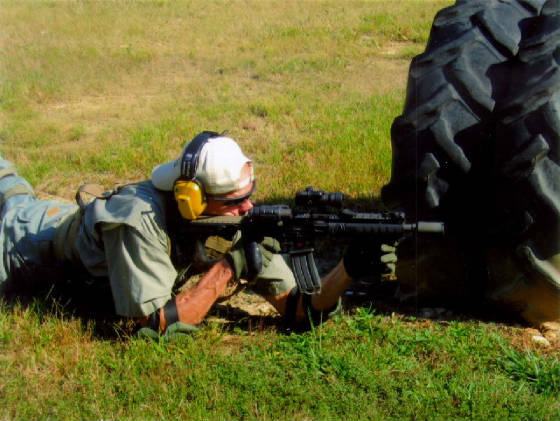 David Bowie, a long-time TDI instructor, demonstrates "roll-over" prone (ROP) and variations. See next photo. 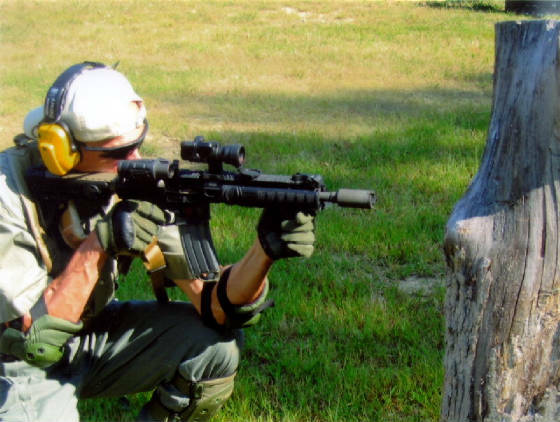 Designed to keep you low to the ground and alive, ROP allows you to return effective fire while being shot at. It's sometimes called "urban prone" or "North Hollywood prone," referring to the infamous bank robbery and ensuing shoot-out. Student fires at his target in this version of ROP. 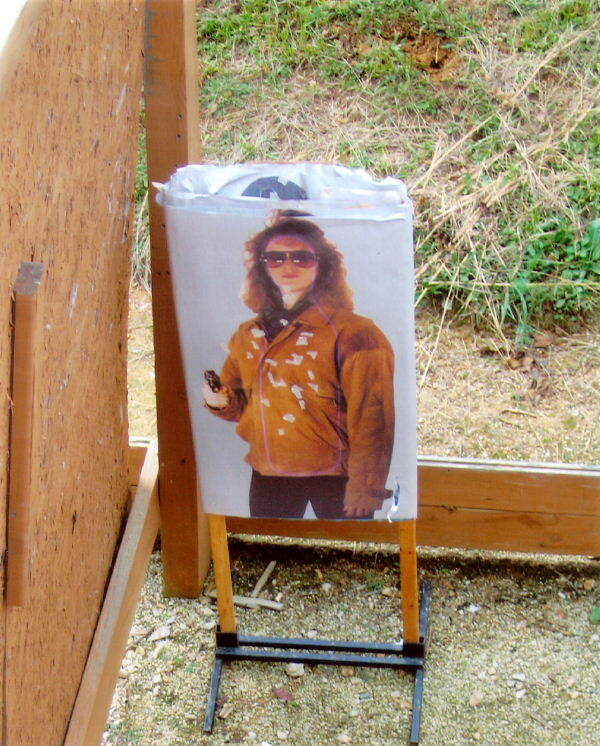 His target, thankfully, wasn't clad in body armor and shooting back with an AK. 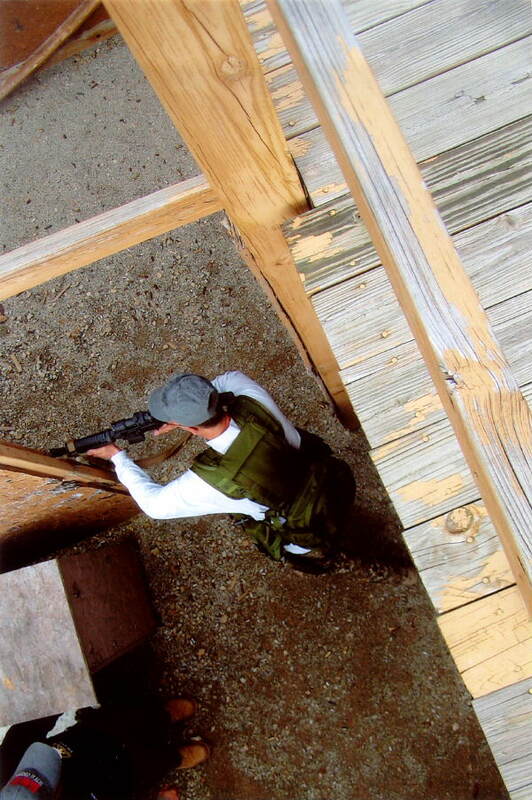 In Tactical Rifle II, the focus is on improving your skill-set in every drill. I really enjoyed TDI’s advanced Tactical Rifle course. 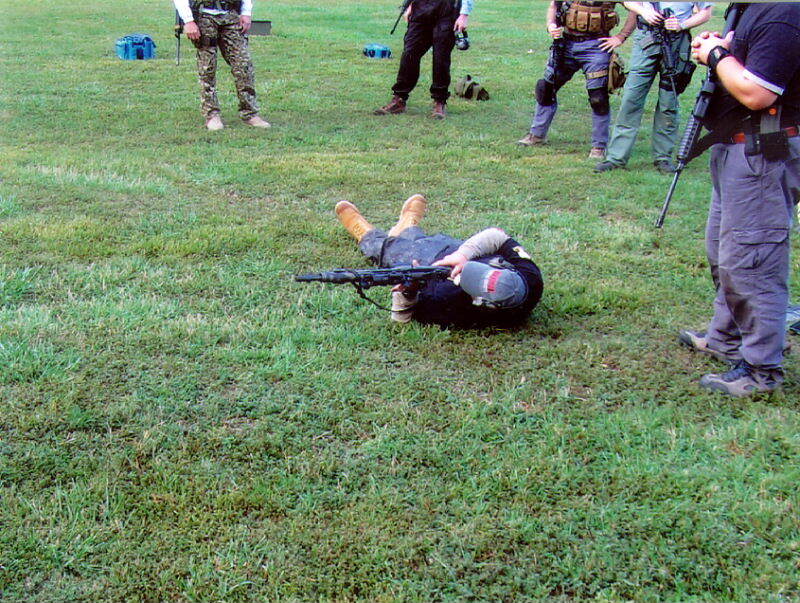 Thanks to the introduction of more difficult drills, new shooting positions and related tactics, the class avoided being merely a rehash of the basic course. The training was definitely two days well spent on skill improvement, and it was a great way to end the summer.